Even after raising $40 million as a tech entrepreneur, Ben Kaufman, 25, still says his first round of funding was the most difficult. It wasn't just because he was fresh out of high school, having celebrated only 18 birthdays at that point. It was because he had to convince his parents to raise the $185,000 he needed by remortgaging their Long Island home — not to pay for college, mind you, but to back a kid's dream of producing a really cool pair of headphones. "I always say it was the hardest convincing I ever had to do with any investor," Kaufman recalls. Before taking that money and heading to China to find a manufacturer, all he had was a prototype concocted out of ribbon and gift wrap. But armed with that prototype and the backing of his folks, Kaufman went on to create the Song Sling, a retractable lanyard headphone. His first company, mophie, is now a near-ubiquitous brand in the increasingly crowded portable battery pack market — all the more popular as social network and location-based apps drain the batteries of smart phones and other mobile devices. Mophie went on to win Macworld's Best of Show award in 2006 for another product, an iPod Shuffle case that integrated a bottle opener and key chain. But when Macworld rolled around the following year, Kaufman decided to do something different. Rather than bringing a new product to unveil, he used his booth space to create a sort of mini-industrial design center. He handed out pen and paper, asking people to submit ideas for iPhone accessories, and clipped those sketches to a clothesline. With 100 or so worthy concepts, he scanned the images, uploaded them to the Web and asked online users to vote for their favorites. Prototyping began the third day of the show, leading to what would become mophie's next product line.This single experience led to Kaufman’s next big move: Selling his company and using that money to develop the technology that would become the backbone of Quirky. A supercharged online evolution of Kaufman’s Macworld experiment, Quirky creates what it calls open-source invention and product development. Quirky Manifesto from Quirky on Vimeo. For $10, inventors can submit product ideas to be vetted by Quirky’s community of about 221,000 users, who are encouraged to vote for their favorites. The top-ranked ideas get reviewed by Quirky's in-house team of experts, who pick one or two products each week based on design potential, uniqueness and viability. The entire process takes place in Quirky’s 30,000-square-foot New York City facility and is live streamed to the Web, all in the spirit of transparency. The ideas that move on go through a series of development phases — research, design, branding, engineering, etc. — before being brought to market. Typically, it's about 120 to 180 days before they end up the shelves of Bed Bath and Beyond, Target, Barnes & Noble and other stores. That’s when the inventors who originally submitted the ideas reap their rewards, generally earning about 35 percent of revenues. Quirky celebrated its third birthday in June and is projected to bring in $20 million this year, a dramatic jump from the roughly $6.5 to $7 million last year, thanks to a growing product line and new distributors. 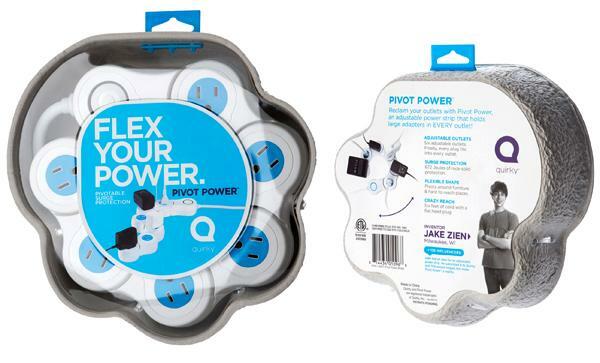 One of the most popular gadgets to date is the red dot design award-winning Pivot Power, a flexible power strip that adjusts so bulky AC adapters don't block other outlets, that has paid about $290,000 to Jake Zien, a design student whose product has sold more than 255,000 units to date. "It's the best feeling in the world to walk to a new friend's house, and you look around, behind the TV and see Pivot Power," Kaufman says. Yet even as Quirky's No. 1 cheerleader, he says he's "super weird when it comes to using [his] own products." "Not because I don't believe in it," he says, reassuringly, "but because it's like a band wearing its own T-shirt. It's kind of awkward." Still, there are exceptions. A favorite of Kaufman’s is one of Quirky's earliest products. PowerCurl, which has earned its inventor about $82,000 so far, is a clip-on to Apple's MagSafe power adapters. The accessory makes it easy to wind up the cables, simplifying the packing and unpacking process. "I use that everyday," Kaufman says. Those brick-and-mortar retail partners are key to Quirky’s success, driving 85 percent of the company's revenue, with the rest coming from online sales through Quirky.com, Amazon, ThinkGeek, Fab.com and other e-sellers. While Kaufman says his retailer partners might be considered "old-school type of companies," convincing them to come on board wasn't too difficult. "A lot of what we do plays directly to their needs and where they're going," he says. "For the most part, they buy into the brand and let us drive what sort of products will be successful." At any one time, the Quirky team juggles about 120 products across the development cycle, with another 75 or so on sale. "It's a lot, but the process is what makes it so palatable." He's referring to the Quirky Process that encompasses the steps from idea submission to store sales. At the heart of it is the Reddit-reminiscent style of community voting that can propel an idea to stardom or leave it languishing. The inventor gets the biggest piece of pie, but along the way, the influencers who vote on successful ideas, help come up with names, pick color palettes or contribute to the final product in some way get a small royalty stake as well. The technology that has driven Quirky hasn't changed much since the company's founding in 2009. But as it looks to the future, Quirky has plans to move more manufacturing operations stateside. "Whenever we start a product, we always think we'd love to make it here," Kaufman says. For its latest project, the team decided to work with factories in New Jersey, Vermont, Maine and North Carolina to produce Crates, DIY modular storage that hark back to dorm living. "Crates is a great example," Kaufman says. "It's the reason why we were able to make the leap." Since Crates was produced in the U.S., from a logistical standpoint, freight made the storage units cost effective. The big expenses were with set up: tools, packaging, labor. "But as long as you're willing to make the upfront investment, the other stuff becomes more palpable," he adds. After establishing these manufacturing partners, the cost to produce in the U.S. goes down over time. Debuting mid-June, Crates is Quirky's most recent and ambitious project to date. Looking back on the last three years, Kaufman calls it a "crazy journey." "This started in my apartment in the East Village, which was above a dive bar. I had this crazy idea to launch one brand new product every week, and we did that."